SCVHistory.com SC0201 | City of Santa Clarita | Copper Fire: Central Park Transformed Into Tent City for Firefighters, June 2002. Central Park Transformed Into Tent City for Firefighters. City of Santa Clarita, California | June 2002. 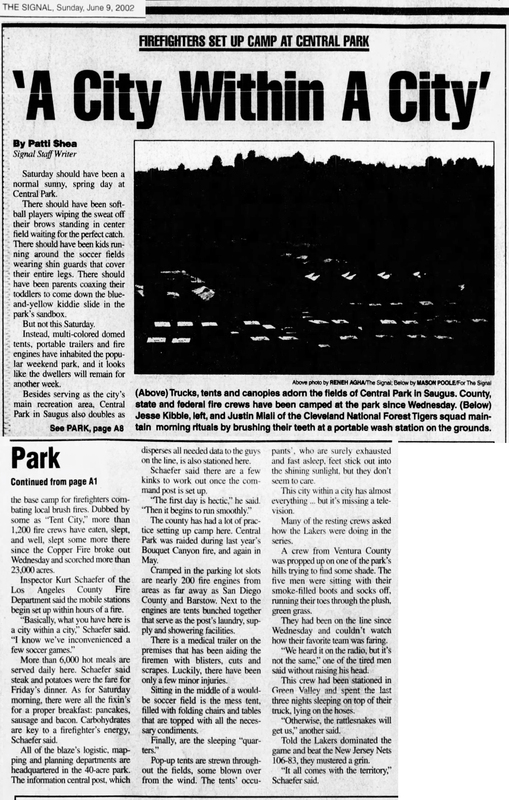 June 2002 — Santa Clarita Central Park is turned into a command post and base camp/tent city for firefighters from multiple agencies who are battling the Copper Fire in San Francisquito Canyon. Photos by Evan Thomason, City of Santa Clarita. Firefighters Set Up Camp at Central Park. The Signal | Sunday, June 9, 2002. Saturday should have been a normal sunny, spring day at Central Park. There should have been softball players wiping the sweat off their brows standing in center field waiting for the perfect catch. There should have been kids running around the soccer fields wearing shin guards that cover their entire legs. There should have been parents coaxing their toddlers to come down the blue-and-yellow kiddie slide in the park's sandbox. Instead, multi-colored domed tents, portable trailers and fire engines have inhabited the popular weekend park, and it looks like the dwellers will remain for another week. Besides serving as the city's main recreation area, Central Park in Saugus also doubles as the base camp for firefighters combating local brash fires. 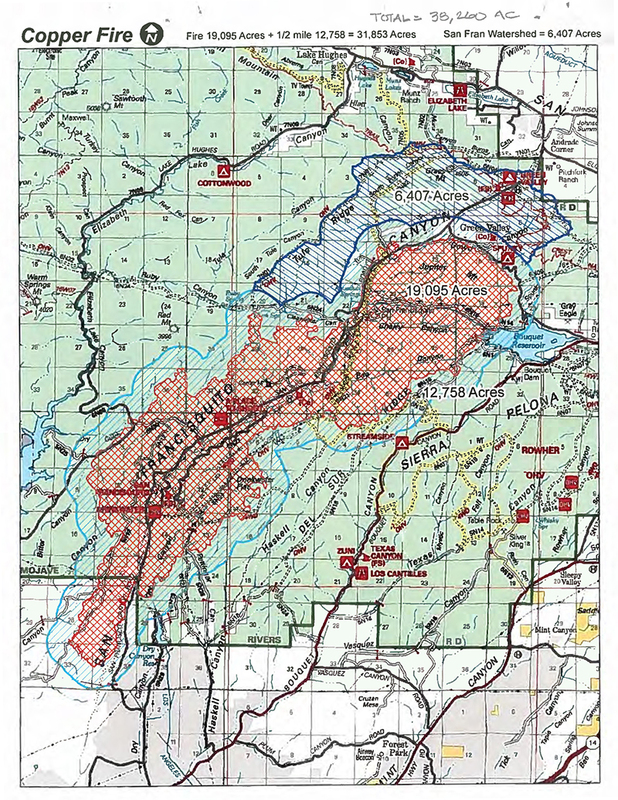 Dubbed by some as "Tent City,'' more than 1,200 fire crews have eaten, slept, and well, slept some more there since the Copper Fire broke out Wednesday and scorched more than 23,000 acres. Inspector Kurt Schaefer of the Los Angeles County Fire Department said the mobile stations begin set up within hours of a fire. "Basically, what you have here is a city within a city," Schaefer said. "'I know we've inconvenienced a few soccer games." More than 6,000 hot meals are served daily here. Schaefer said steak and potatoes were the fare for Friday's dinner. As for Saturday morning, there were all the fixin's for a proper breakfast: pancakes, sausage and bacon. Carbohydrates are key to a firefighter's energy, Schaefer said. All of the blaze's logistic, mapping and planning departments are headquartered in the 40-acre park. The information central post, which disperses all needed data to the guys on the line, is also stationed here. Schaefer said there are a few kinks to work out once the command post is set up. "The first day is hectic," he said. "Then it begins to run smoothly." The county has had a lot of practice setting up camp here. Central Park was raided during last year's Bouquet Canyon fire, and again in May. Cramped in the parking lot slots are nearly 200 fire engines from areas as far away as San Diego County and Barstow. Next to the engines are tents bunched together that serve as the post's laundry, supply and showering facilities. There is a medical trailer on the premises that has been aiding the firemen with blisters, cuts and scrapes. Luckily, there have been only a few minor injuries. Sitting in the middle of a would-be soccer field is the mess tent, filled with folding chairs and tables that are topped with all the necessary condiments. Finally, are the sleeping "quarters." Pop-up tents are strewn throughout the fields, some blown over from the wind. The tents' occupants', who are surely exhausted and fast asleep, feet stick out into the shining sunlight, but they don't seem to care. This city within a city has almost everything ... but it's missing a television. Many of the resting crews asked how the Lakers were doing in the series. A crew from Ventura County was propped up on one of the park's hills trying to find some shade. The five men were sitting with their smoke-filled boots and socks off, running their toes through the plush, green grass. They had been on the line since Wednesday and couldn't watch how their favorite team was faring. "We heard it on the radio, but it's not the same," one of the tired men said without raising his head. This crew had been stationed in Green Valley and spent the last three nights sleeping on top of their truck, lying on the hoses. "Otherwise, the rattlesnakes will get us," another said. Told the Lakers dominated the game and beat the New Jersey Nets 106-83, they mustered a grin. 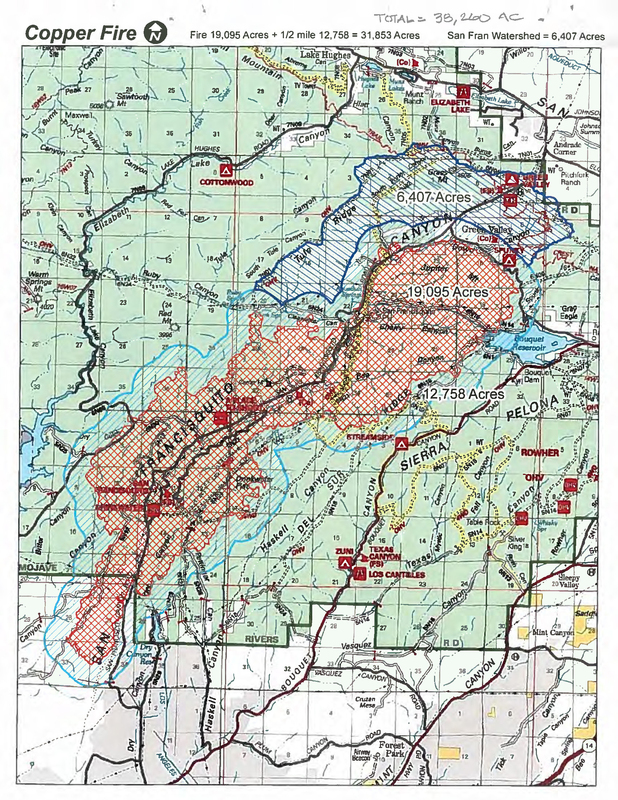 "It all comes with the territory," Schaefer said. SC0201: Download original images here.